When Microsoft unwrapped an early version of IE9 yesterday, it proved beyond doubt something we've suspected for a while: IE is the Bono of browsers. The similarities between the Irish singer and a Windows web browser might not be immediately obvious, but they're there. In their early days U2 were underdogs, and no matter how good their records the critics would say "U2! You are rubbish! And your singer has a stupid name!" Early IE was like that too. Netscape was the critical darling, and early IEs were greeted with derision. Being underdogs suited U2. They made better and better records, got better and better at doing gigs, and eventually everything came together. U2 released The Joshua Tree, a brilliant album that conquered the planet. It was the same with Microsoft. Internet Explorer 4 was its Joshua Tree. Naturally, things went badly wrong for both U2 and Microsoft immediately afterwards. U2 were no longer underdogs, and they followed The Joshua Tree with Rattle & Hum, a film-and-album package that made even life-long fans want to punch them. The criticism stung so much that it forced U2 into underdog mode again. The next record, Achtung Baby, was a career highlight - and it put them on top of the world again, so they responded with more duff music. The lukewarm reaction to Pop resulted in Bono "reapplying for the job of the best band in the world", and the result was All That You Can't Leave Behind. According to Rolling Stone, it was "their third masterpiece." There's an obvious pattern here: when U2 are underdogs, they're great. When they're not, they're not. Microsoft suffers from the same thing. Just look at Windows Mobile, which has been lacklustre for ages. Now Apple and Android are coming to eat its lunch, Microsoft is rediscovering its mobile mojo. Exactly the same thing's been happening in browsers. As soon as its browser ruled the web, Microsoft stopped bothering; if it weren't for Firefox, IE6 might still be the most recent Microsoft browser. 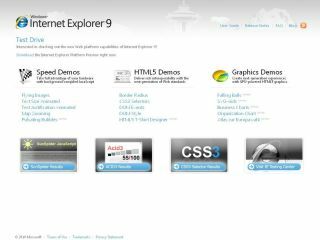 However, thanks to Firefox and Johnny-come-latelys such as Chrome, Microsoft is in underdog mode again, and that's really apparent in the IE9 preview. When reviewers - rightly - pointed out that IE8's Sunspider results were woeful compared to every other browser, Microsoft sent them patronising How To Review Browsers documents and dismissed Sunspider as unimportant. This time round Microsoft has sorted out the Sunspider performance and it's running around shouting "Benchmarks! Benchmarks! Benchmarks!" Of course Internet Explorer, like Bono, will always have its enemies. There are people out there for whom the very thought of Bono makes them want to punch a nun, and there are people out there who will forever associate the words "Microsoft" and "browser" with security problems and poor standards support. With IE9, though, Microsoft is singing a brand new song of security, and of standards support, and of hardware acceleration. Provided Microsoft doesn't mess it up, the release of IE9 could turn out to be - yes! - a Beautiful Day.